Hermitess (aka Jennifer Crighton) recently released a video for “Blood Moon”, taken from her upcoming self-titled Album. She has been making a series of artworks alongside the musical compositions: photographs and almost-still videos set against remote landscapes. Each of these settings depict Hermitess as a central figure in a settings that evoke the songs. The Blood Moon video was shot by her friend Tatiana Losev who helped direct the simple performance that the video depicts. The final product is meant to express a feeling: something repetitive, hypnotic, and a tad sinister. You can read more about the video over at Atwood Magazine. First interview on q this morning is with Michael Rooker. Hi All. Sorry haven’t been around lately – too busy at work! Anyone going to the smugglers thing next week? @Russ & @Yort have fun, it will likely be the main event this year for the Ex-R3ers! 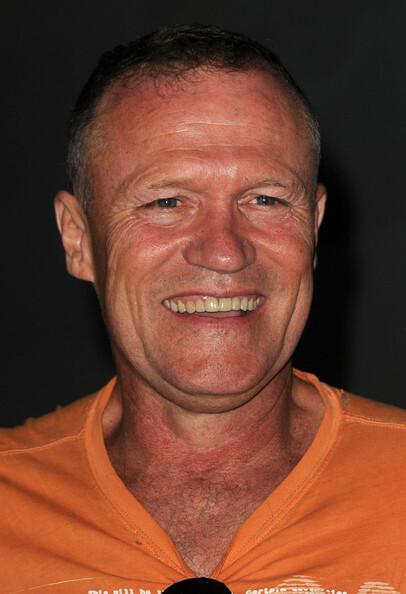 That is a ginormous blue Michael Rooker! garf: ah! <——– I BLAME GARFIELD!!! It’s quite amusing, CSIS just announced the suspension and review of use of stingray devices. Which use, if I remember correctly, was subject of a leak, and which CSIS has never admitted having the tech for, much less using. the blue man scared me away! YVR trip + NXNE will pretty much be our summer. I will be at The Smugglers as well! It just happened to fall into the week we were going to be there anyway. Serendipity. I am still trying to convince people to come to Gateway Music Fest. I can help get people there and find accommodation. There are a couple people interested so far. This album by Wilsen that came out last week is simply beautiful. Interesting. Did you enjoy the show? Yes, it’s a cool bar, very relaxed, and the openers were also good. A fine show. Let’s just say that for “live”, Wilsen the band go much more rock n’ roll than folk, or than “woman-poetic songwriter”. I imagine it would be easier to hold the crowd’s attention that way. The album is so lovely but I am not sure how that would work in a live bar show. Maybe a soft-seater would work better for that. We’re going to be up your way in July, Benoit. Maybe there will be a good show or two. what about Ness? you going? I told my man-friend about Richard Thompson being at Brandon. It definitely interested him, but he has seen him and wasn’t interested in much else there. He will coming to Gateway with me. I am not sure about Ness. I would like to but I am not sure I can swing it. It’s still on my tentative plans. I have been going non stop since my feet touched the floor this morning. I need a break before I go to work. I have turned on Wilsen and it is aiding in the relax time quite nicely so thank you. You are welcome. Now rest and relax and enjoy. no nap but nice visit with a friend who also enjoyed thematic.